On the Edge: Lodge Kerrigan Talks Collapse and Chance in "Keane"
With his latest picture “Keane,” Lodge Kerrigan reaffirms the maverick mantle he established over ten years ago with his 1994 debut “Clean, Shaven.” As unnerving and concise as his celebrated bow, “Keane” is also a more full-bodied and emotionally harrowing expression of Kerrigan’s talents. Starring British actor Damian Lewis (in a riveting performance) as the title character William Keane, the film stalks its protagonist — as he reels from the abduction of his young daughter — with the tightly observed, hand-held camerawork reminiscent of the Dardenne brothers (“Rosetta,” “The Son“). A visceral exercise in post-9-11 anguish, a bravura use of long-take realism and only Kerrigan’s third completed film in over a decade, “Keane” is one of the most masterfully crafted truly American independent works of the last few years. Kerrigan spoke to indieWIRE contributor Anthony Kaufman during last year’s Toronto International Film Festival about grief, risk-taking and bouncing back from his previous project “In Gods Hands,” a fully produced feature that was scrapped because of negative damage. indieWIRE: As far as I was concerned, this movie came out of nowhere. I had no idea you were making it. When was it shot? Lodge Kerrigan: We shot in March-April 2004; we picture-locked in 8 weeks. Given the style of the film — long takes, in camera editing, no traditional coverage — I don’t think technically it was a complicated movie, so I didn’t see the reason for it to take a long time. But we didn’t turn it around that quickly. There was an 8-week production, a 32-day shoot, but the post was really quick. iW: Where did the idea come from? Kerrigan: Like every parent, you lose your child sometimes in public. I have a willful and independent daughter, Serena, and I try to encourage her curiosity. But she’d run off in pharmacies or supermarkets, and I couldn’t find her, and my heart would go in my mouth. iW: I feel like it’s a very post-9-11 film. iW: Disappearance, paranoia. . .
Kerrigan: Unsure of the city, destabilizing environments, sure, why not? Maybe it seeped through. But I try not to over-analyze. For me, what I was primarily interested in was how a person would deal and survive having their child abducted, if the child was in their care when it happened, and how in a very short period of time your life can change irreversibly. Can you ever survive the extent of the grief that would cause, and how destabilizing that would be and how would you move beyond that in some way and continue to have love? I think that would take a lot of courage. iW: Can you talk about the scene in which he sings the Four Tops’ “I Can’t Help Myself (Sugar Pie, Honey Bunch)” in a bar? That was the first scene where I felt like I could really feel his pain in a very visceral way. How did that scene evolve? Why that song? Kerrigan: I heard the song on the radio while I was location scouting and it just seemed to fit. It had this real pathos. Certainly, it’s a sad love song, but musically, it’s more upbeat. I was interested in the presentation of Motown itself, glamorous and stylish, with somebody who is the antithesis of that, someone who is very isolated and living on the street in cheap motels, ill and unraveling. I thought it would have a greater emotional impact. As for the scene, like the main character in “Clean, Shaven,” he suffers from mental illness. With the song, I wanted to have him drowning out everything that was in his head, and just try to escape all the pain and the grief and any hallucinations he may be experiencing, and trying to push it out with overwhelming himself with the song and the music. 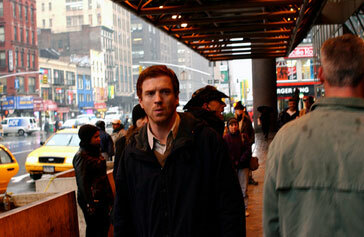 Damian Lewis in Lodge Kerrigan’s “Keane.” Photo courtesy Magnolia Pictures. iW: Can you talk about the instructions he gives to himself, like “Go, go, now, now” and the idea of this running commentary. I think it was a dangerous device. Kerrigan: The whole film is risky; the whole aesthetic is risky. The commentary — you have to believe that he would do that, but I find it believable. At periods of my life, I’ve talked to myself. But it’s the kind of film that if it comes off wrong, it would be a major problem. About the aesthetic of the movie, in particular, there is no traditional coverage. I’m running 4 minute takes. I would have run longer takes, but we’re limited to 400-foot mags and the entire film is shot handheld. If John Foster, who did an excellent job as D.P., could have held a 1000-foot mag, I would have gone 7 or 8 minutes. Kerrigan: Because the film is so emotionally harrowing, I think video would have been too immediate. I think film gives it a slight distance that allows you to engage in it even more emotionally. I remember people pulled me aside before shooting and said, you should get traditional coverage, and I was like, no I’m not doing it. I had a particular vision of how it would look and I wanted to push myself. There is no coverage, no cutaways; it either works or it doesn’t. In one scene in Port Authority, we clocked it at 399 feet, so if the take had gone more than 5 seconds longer, we couldn’t have used it. iW: You were living on the edge? Kerrigan: We shot in Port Authority where we couldn’t shut down. So we’re shooting live, it’s all live, and the A.D. did a great job of managing the Port Authority. We had a lot of extras, so we could control the number of people looking at the camera, but you can’t control the live traffic flow, and how many of those people are turning around and staring at the lens. But I would do it again. It was so alive; I think it really helped the performances. iW: Is there something self-destructive about it? There are so many things that could go wrong. Kerrigan: I made a film before this, “In God’s Hands,” that had really extensive negative damage to the point where we had to abandon the project. And the insurance company stepped in and reimbursed everything. That was very traditional coverage, but look what happened. There’s always an element of risk in what you do. This was a calculated risk, and what I thought it would bring and add to a movie, that sense of realism and energy, was really worth it. The producers, Steven Soderbergh and Andrew Fierberg, were totally behind it. Steven thought it was great. He was like, ‘Do it, just shoot everything completely wide, and get a crew of 3, and just go in there and totally give yourself over.’ It’s tough to immerse yourself, and it’s tough to do that with a big crew. It’s tough to shoot in live environments and still have spontaneity, because film crews just take over. And everyone wants to do their job, but if you shoot in a live environment, you can’t have a lot of people on set. So you have to work against it. And the crew was very supportive of it. iW: Was the disappointment of “In Gods Hands” crippling? Kerrigan: I bounced back pretty quickly. I think there was a 2-year period, between that and this. I wrote a new script. Steven went out and got it financed. It is a very devastating thing to happen, and the most devastating thing for me was how so many individuals turned their back on it, and ran for cover. That was really upsetting. Steven was the only one; he stood behind me the whole way. It was due to him that I got this made so quickly. Crippling? No. Devastating? Yes. At that point, I was reading a lot of Murakami’s work. I found a lot of peace in it. You suffer bad fortune in life, but nobody got hurt. iW: You’re in a very unique position as a filmmaker, I think. Your last film was financed entirely overseas. I wonder if you feel like you are an “American director” or are you in your own world making films? Kerrigan: In terms of being in my own world, when I write a script, I become my own audience. If I start to wonder how other people are going to react, than I’m going to trust myself less. And if I trust myself less on the set, in my own beliefs and taste, then I’m lost. It’s my only reference. I think largely it’s an economic question. I work in a low budget level because it’s appropriate to the films that I want to make. It is a business. I accept and like that it’s a business. I think it’s immature to think that you can get as much money as you want and make any film that you want and expect any distributor to find an audience and support a bigger budget than the film warrants. I think it’s a real responsibility for filmmakers to look at the work and ask does story warrant the budget. I think what’s happened, and it’s very clear, is that the majority of filmmakers want to make bigger and bigger budget movies, and people who invest in film, want to make a bigger and bigger profit. So it becomes about economies of scale. So the minute they become bigger, they need a wider audience. Then it becomes less about an individual vision and more about a demographic. So decisions get made about who the audience is, and I don’t take partake in that. I don’t have to, because I work on a low budget level. And that’s the compromise that I’ve made.